Converting single or multiple Colored Images to GrayScale is now just few clicks away. There is no need of an expensive image editor or complex procedures to be followed. The Image Resizer can be used to convert color images to grayscale really easily and quickly. All you need to do is launch the Image Resizer Software, look at the bottom of the software where you will find an checkbox labelled Convert Images to GreyScale, Check the Checkbox and then select the colored image to be converted to grayscale and click on the Convert button to convert the selected image to grayscale. 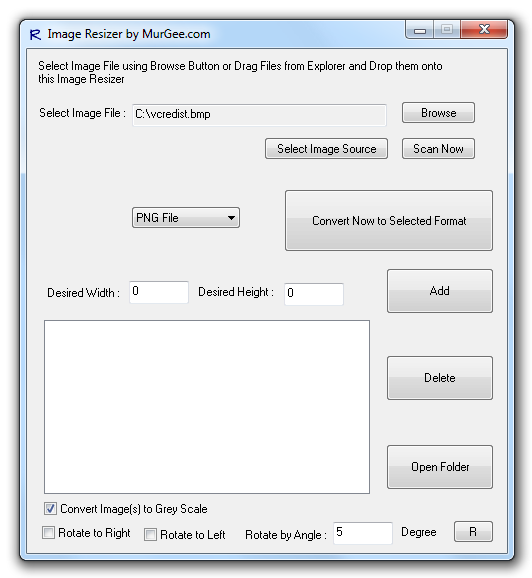 In order to convert multiple images to grayscale using the inbuilt image converter, just drag the selected images / pictures and drop them onto the main screen of the Image Resizer. The Image Resizer has lots of other useful image editing features as well and works fine on Windows 8, 7, Vista and XP. Whether you are using a 32 bit Windows or 64 bit Windows, this Image Resizer will work fine and will seamlessly convert Colored Images to GrayScale using the inbuilt converter. You can even resize the output images to any selected resolutions apart from converting images. Note that the term Black & White is different than GrayScale and as of this writing the Image Resizer can be used to convert colored images to grayscale only.